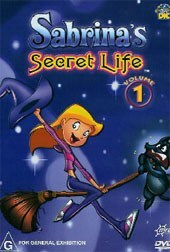 Sabrina's Secret Life Volume 1 is a great cartoon series that features the first three episodes of this entertaining show that features the half-with Sabrina. An entertaining and easy to follow storyline that children of all ages will simply adore. Half-witch Sabrina enrolls in secret witchcraft training classes while attending her normal, mortal high school, but discovers she must share her clandestine instruction AND her regular school with a full witch from the other side who makes her life miserable. PORTIA, a snooty young witch from the other side and niece of ENCHANTRA, the most powerful sorceress of all time has been sent to attend school with Sabrina to learn how to fit into the mortal world of ordinary teenagers. Unfortunately, Portia immediately gets a crush on Sabrina's long-time boyfriend, HARVEY! Thus the stage is set for the magical mayhem in the craziest, weirdest, most mixed up world of all: HIGH SCHOOL!! Sabrina is having a tough week. Cassandra, Margaux, and Tiffany are being a pain at school. Her aunts blame her for a mess Salem made in her room. Even reliable Harvey seems to be ignoring her. So Sabrina takes a break and tries out the Doors of Dreamland in the Netherworld. There, a witch can live out her fantasies. Sabrina chooses to be a warrior princess, admired and feared, and totally in control of her glamorous life. Doubles for Cassandra, Margaux, and Tiffany appear in her fantasy as miserable peasant girls, her aunts are royal castle cleaners, and Harvey is a captured prince, locked away in her dungeon until he pays proper tribute to her. But the ride is over far too soon, and Sabrina has to go back to real life, where nothing has changed. Sabrina misses her fantasy world and works frantically to earn enough witchly credits for a return, and she goes back to her fantasy. When she returns, Salem warns her that she cant live forever in Dreamland its not real. It was made for fun, not as a place to escape your real responsibilities. Sabrina doesnt want to listen and works all night to be able to afford another trip. Friend Salem has to find a way to get Sabrina to see the bad side of this fantasy obsession, and to remind her of all the good, fun things and friends she has in her real life. Cassandra asks Harvey to a school dance only to find that Maritza beat her to it. When Sabrina hears, she is crushed. She thought Maritza was a friend. What she doesnt know is that Maritza, overhearing Cassandra tell Tiffany and Margaux that she was going to approach Harvey shortly, decided to ask Harvey out on the spot and un-ask him later, so Sabrina could then ask him. But Cassandra turns Sabrina against Maritza, and now Sabrina is not speaking to her former friend. Maritza¿s feelings are hurt, and she decides to keep her date with Harvey. Meanwhile, Cassandra plans to ruin Maritzas evening with a series of embarrassing events ¿ like turning her spaghetti-strap dress into real spaghetti, turning her lipstick into crazy glue you get the idea and all with Sabrinas collusion. At the last moment, Sabrina finds out the truth and has to save Maritza from Cassandras spells, even though it means letting her have a wonderful evening with Harvey. Its fundraising time at both of Sabrinas schools. Sabrina bites off much more than she can chew and decides to win Top Sales at both schools, simultaneously! And she does, working herself ragged, pounding on every door she can find. Shes the hero of the day! But when the Upper-School COOKIE DOUGH gets mixed up with the Under-School CURSED ECTO-PLASMA FROM THE NETHER REGION comical chaos ensues. Greendale citizens are undergoing straaaaaange transformations and inhabitants of The Realm are packing on a few extra pounds around the hips. With Salems questionable assistance, Sabrina retrieves every last ounce of the plasma and switches it back with the cookie dough. Except one last batch, which went to the sweet old lady down the street, who now has fangs and wings and is flying off into the moonlit night.